In my summer overseas report covering the Volvo Auto ClubeBrasil, I mentioned that they had a P1900 registered. Upon reading this Dan Janson, editor of the Svenska Volvo PVklubben magazine contacted me asking for further information on this very rare car. I was then able to put Dan in contact with Sergio Ribeiro, Volvo Auto Clube-BR who would start the hunt for the P1900 - the 'Plastic' car. In the meantime I was able to research the P1900, known as the Volvo sport. The car had a tubular steel chassis with rugged crossmembers, outer side members and cries-cross reinforcement. The body was made of polyester reinforced with glass fibre. The engine was the B14A with twin SU carburettors which developed 70hp at 5,500 r/min, although the car was only equipped with the old three speed gearbox which was hardly conducive to sporty driving. The other components were nearly all standard parts from the PV444. There was little demand for the P1900 in Sweden. Only 44 cars were built in 1956 and a further 23 were produced in 1957. Only 68 cars were produced but 2 had the same chassis numbers, plus four or possibly five prototypes. The last car was finished on 21 May 1957 - the car was not up to Volvo quality standards. It was, furthermore, not only an oddity in the Company's range, but it was also too expensive to produce. Added to this, the glass fibre body was a one off Most of the 38 cars sold in Sweden appear to be still in existence. The major proportion of the 1957 production went to the USA, although cars were also sold in Belgium and BRAZIL. In July Sergio Ribeiro traced 'our P1900' in Sao Paulo. 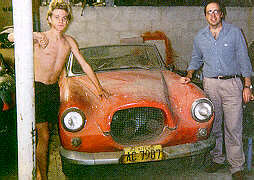 It is now owned by car collector Flavio Marx who bought the car some years ago in Rio de Janeiro. It is known that the previous owner had saved the car from scrap by minor restoration, and had used it for some time. Further investigation revealed that the car was the only P1900 exported to Brazil, arriving in the country on the 13 February 1956 for a Volvo Car exhibition. This has been confirmed by the VIN plate which bears Serial No 11, Body No 652484. The car is in need of complete restoration, It now has a B18 engine fitted, the fibreglass body is intact and almost all new external parts are needed. One of the problems that its owner Flavio had is lack of information to restore the car. Sergio and the Volvo Auto Clube-BR have provided this and offered their help with the project. 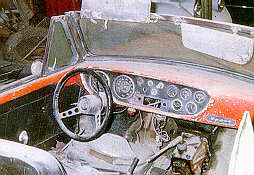 Work is to start on the restoration of the car as soon as possible . The Volvo Sport, which was now known as the P1900, was subjected to gruelling tests in Sweden. The engine was a B14A with twin carburettors which developed 70 hp, but the other components had been taken from the PV444. There was little demand for the P1900 in Sweden, however; only 68 cars were produced and production ceased within one year.